For the statistically minded, to date we have laid 35-40,000 tesserae… one by one. Once the four-strand guilloche is complete – and it could be by the end of this, the tenth week – we will have completed over six square metres of mosaic floor and there is only one further, fairly simple (or so we believe) pattern to complete before the mosaic is complete! But that doesn’t mean the floor is finished. The mosaic section covers about 10 square metres of a total of 25. They rest of the room will be paved with terra cotta – coloured tesserae. They are 4 times the size of our mosaic tesserae at 2m x 2cm and do not form a pattern – more or less laid as a pavement. As such we call this type of floor a tessellated pavement. Actually, a mosaic is also a tessellated pavement but is called a mosaic when it is made into shapes, patterns and figures. 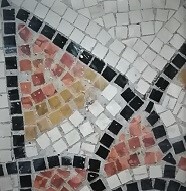 This arrangement of a central mosaic surrounded by a plain surround is quite typical of Roman floors for this type of room (quite a fancy one). People often ask when we plan to finish. It’s still hard to answer but we hope to have the central mosaic completed before it gets too cold! Maria sorting tesserae prior to laying.